Short term load forecasting; deep learning; smart grid; factored conditional restricted boltzmann machine; conditional restricted boltzmann machine; rectified linear unit. I suggest you load the IEEEtrantools package. It provides quite a few of the macros and environments of the IEEEtran document class, for use with other document classes -- such as the article class. For instance, the IEEEtrantools package provides an environment called IEEEdescription, which you appear to use. to be inserted in the preamble. Some additional comments. (a) The cleveref package should be loaded last. (b) I can think of no good reason for typesetting the words Sigmoid, RMSE, and MAPE in math mode. (c) I think it's rather questionable to write boltzmann; do write Boltzmann instead. 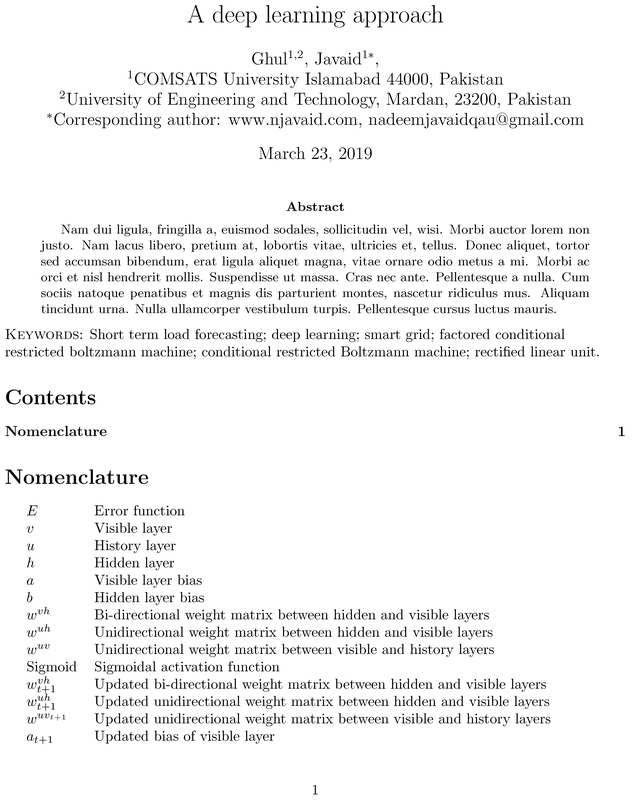 Why is the following LaTeX code invalid? what's the problem with the following code? This code gives the error “missing } inserted”. What is this error?